I sold GE on Monday for around a 36% loss (it's a little less because of dividends). I wrote numerous times how I thought the company was unfairly punished by the market. Some people called GE "an unregulated bank." They were right. I was wrong. I sold because I think the stock will continue going lower. I also think there's a possibility there will be a dividend cut. Another thing that motivated me to sell was the CEO coming out on CNBC to say that things were going well, considering the current economic environment. He talked up the stock. A few days later, GE announced a $12 billion share offering and a $3 billion loan from Warren Buffett with 10% interest. Immelt had to have known about this when he went on TV to talk up his stock. There goes my trust. New rule of thumb: whenever a CEO goes on TV to say things aren't as bad as they appear, things are probably worse (think Bear Sterns). That said, I'm looking to buy GE back later this year or next year, probably for a lower price. If anyone benefits from the eventual recover, it'll be GE, supposing it survives. JNJ and PG: They were doing just fine until this week. I'm keeping these guys for now. They might go lower, but I think they're great companies with bright futures. I'm a little worried that Cramer keeps recommending them, though. That's rarely a good sign. ESLR: This is one volatile stock. I'm looking to buy back my calls for lower than I sold them. I'm also looking to sell my October puts, perhaps rolling them farther ahead. If this company survives, I think it'll turn out to be a great investment. CPSL: Why do I own this piece of crap? Great earnings growth, and it's in a country that will be the world's economic superpower in the future. CPSL is also very volatile, and I bought it to write covered calls. When it was trading in the $4 range, the 5 strike calls a month out went for $30 to $50. So why is CPSL trading below book value now? There's the general sell off. Also, CPSL is in the steel industry, which is certainly out of favor. Chinese stocks are particularly loathed right now as well. Lastly, the company has negative cashflow. That's never good. If it survives, I think it'll be a great investment. The company is boosting production and has a decent order backlog. I'm looking to buy back my calls for a lower price, wait for a rebound, and sell the calls again for a higher price. PM: While its share price is down significantly, my favorite tobacco company is expected to post good earnings on October 22. We'll see if people around the world started smoking more because times are tough. The firm's European sales will probably be poor, because of the Euro's weakness against the dollar and lower sales volume. Although I may change my mind, I want to keep this company for as long as possible. As long as there aren't any dividend cuts, I'm probably not going to sell. I might pick up a few more shares, depending on how much further the stock falls. I've been making some decent gains with puts in the last few weeks. I'm waiting for a rally to buy some puts on SPY and QQQQ. We haven't had a sustained rally (that's longer than a couple of days) in quite some time. 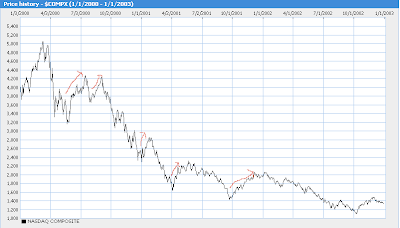 Below are charts of the Dow from 1929 to 1933 and the NASDAQ from 2000 to 2003. There were a few pretty good rallies during the huge drops. I'm pretty sure the general direction of the market will be down for some time. That's why I'm not buying calls. I'm being careful with puts as well, because I don't want to buy just as a rally gets underway. While I'm waiting for a rally, I'll by trading the SPY 72 March put. My plan is to buy it around $1 and sell around $2 a couple of more times. I'm also looking to buy puts on companies that will probably go out of business if the economy continues to suffer and the credit markets remain frozen. I'm thinking of companies with massive debt, low margins, and a reliance on the consumer. RHD is a great candidate, but I'm too late to this one. Avis (CAR) is an example of companies that I don't think will survive if times get tougher. I'm also watching Whole Foods (WFMI). It's got obscene evaluations. I think the stock should be trading at $10 a share. I'm looking to buy puts four to six months out if WFMI rebounds to $20 a share or higher. My investment portfolio is about 40% in cash at the moment. 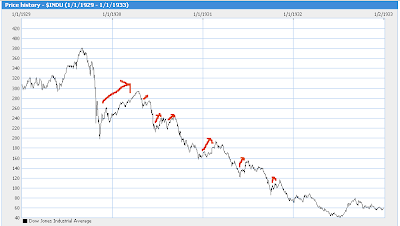 I keep track of my trades in the lower right portion (under "free stuff") of this blog.